Aluminum is a silvery white metal which has become one of the most popular materials chosen for metal stamping today. Aluminum possesses many characteristics ideal for a variety of high performance applications. Aluminum stamping is commonly chosen for projects where weight must be accounted for without sacrificing strength and is used prominently in the automotive, appliance, electronic, medical and aerospace industries. 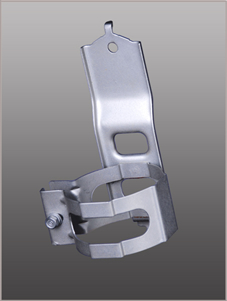 Metal stampings made from aluminum or aluminum alloy are also recyclable and more corrosion resistant than plain carbon steel stampings. Winzeler Stamping Company sources aluminum from reputable suppliers with a proven history for quality. Our aluminum stamping capabilities include: blanking, piercing, forming drawing, and machining. 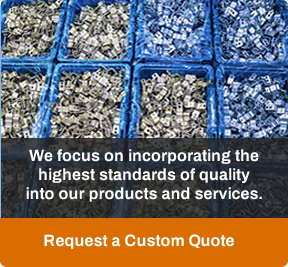 You can be certain that our strict quality standards and inspection processes translate to repeatable accuracy and reliability of your part. If you have an application which requires aluminum stamping, Contact Us to discuss or fill out our custom quote form and submit your print. Winzeler Stamping Company offers a comprehensive range of stamping and machining capabilities using a wide variety of metals including brass, eco-brass, copper, steel, stainless steel and others. Visit our photo gallery to view a sample of our work.